As seasoned custom designers, we’ve seen three stone engagement rings wax and wane in popularity during our decades in business…but frankly, they only wane so much. Visually, there’s the classic appeal of a three stone ring, with it’s dazzling “wrapping effect” around the finger. But perhaps more importantly, there’s the deep significance that resides in a three stone engagement ring. Of course, there’s the obvious symbolism: a ring that represents the past, present and future of love. Some opt for the middle stone to be the largest, to serve as a reminder of the importance of living in the present, not holding on to grudges from the past or worrying excessively about the future. Three stones can also symbolize fidelity, friendship and love–a wearable reminder of the keys to a good relationship. Lastly, three stone rings can also possess religious significance with the stones representing the Holy Trinity. 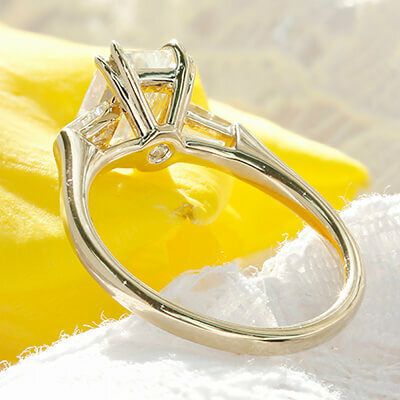 So as you see, a three stone ring can mean many things to the wearer. One thing it always means? Beauty. 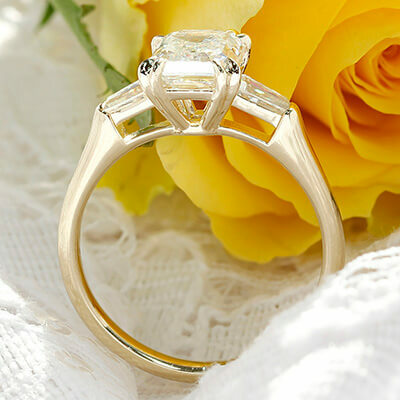 Let us custom design a three stone engagement ring that’s right for you. We’re experts at translating your deepest wishes into a wearable reality. If you have a significant male in your life, share this. So many jewelry mistakes can be easily avoided so YOU get the jewelry of your dreams. The takeaway: an informed customer is a happy customer. When men spend the time to research and ask questions, the women in their life receive a lifetime benefit. What is a bullet cut diamond? Well you can guess what it’s named after so we won’t bore you with the backstory. Consider them baguettes with one narrow end cut into a V-shape. There are two kinds of diamond bullets: tapered and straight. Tapered bullets are generally considered more attractive. 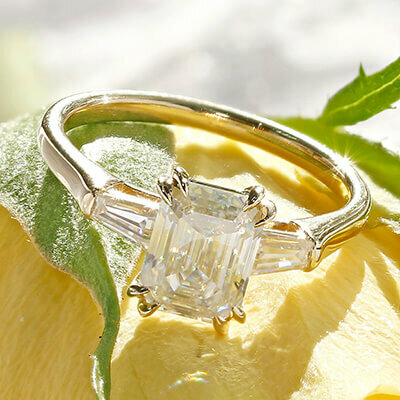 Step cut bullets pair well with Emerald and Asscher cut diamonds in the center (as seen in the example above). Brilliant cut bullets pair well with brilliant cut center stones, including colored stones, a particularly fetching look. If you’re looking for a custom design ring with bullet cut diamonds or diamond alternatives, let us shoot you in the right direction! You’re at the alter with the man/woman of your dreams. You’ve said your vows and now its time for The Big Kiss. You really want to make the most of it. You want to show your partner and those witnessing your lovely betrothment just how much you REALLY LOVE your new partner. So you lay a big kiss on her/him. Like, a really big one. You come up for air and dive back in again, to really drive the point home. Your loved ones writhe with discomfort. A few family members start coughing loudly as if to say: Just. Stop. Already. Apparently, YOU didn’t read up on the proper etiquette of alter kissing. Don’t be Sloppy. Keep your mouth closed please. Nobody wants to feel awkward watching this important moment. They want to see the love…not the honeymoon. Don’t Surprise Him/Her. Weddings are not a time for new tricks. Trying that tango-style dip on her could mean an accident that no one will forget (especially her). Practice your big kiss. You’ve practiced everything else, right? Work on timing: how the two of you approach one another (slowly, not too quickly), where to place your hands and how long to kiss. Create a mini-drama out of it. Think of a romantic moment in a movie that takes your breath away. Recreate it for your loved ones to see. Final pointer: toss these tips away! It’s your big kiss after all. Make it as unique and special as the two of you. Has anyone ever written a song for you? A poem? Certainly it must be a deeply flattering feeling. But what about having a massive gem named after you? Just ask Manami. Recently, Sotheby’s Hong Kong sold an 88.22 ct. D flawless oval for $13.8 million to a Japanese collector who named it Manami Star, after his oldest daughter. The sale of the egg-size stone was much anticipated. The auction house boasted that the diamond was “perfected by every critical criterion”—both externally and internally flawless and with excellent polish and symmetry. It is also type IIa—rare for a natural diamond. Does a Bigger Wedding Mean Longer Lasting Love? But with some research, I might have to eat a little proverbial crow. Apparently size does matter. But not for the reasons you might guess. There is some reason to believe that having more witnesses at a wedding may actually strengthen marital quality. According to the work of psychologist Charles Kiesler (1971), commitment is strengthened when it is publicly declared because individuals strive to maintain consistency between what they say and what they do. Social scientist theorized that, early in a marriage, marital stability and commitment would be positively associated with the ceremonial effort and public nature of a couple’s wedding. Rosenblatt specifically suggested that holding a big wedding with many witnesses would lead to a stronger desire—or even need—to follow through on the commitment. Does that mean you need a big wedding to have a healthy marriage? Absolutely not. Scientific results aside, there are far too many factors that come into play when it comes to successful relationships. And let’s not forget: a big wedding that you can’t afford or never wanted can never be a good thing, right? Is your jewelry out of sight, out of mind? Upgrade your storage space! As Christie Ressel comically describes, many women use an old box or drawer for their accessories, meaning they don’t have easy access–things are just too messy and cramped. This means less wear of more precious items. Out of sight, out of mind. Why not expand your horizons and open up your jewelry storage space? Isn’t it time? The devil is in the details. That’s why we work so hard to make sure every detail of your custom design is just right. 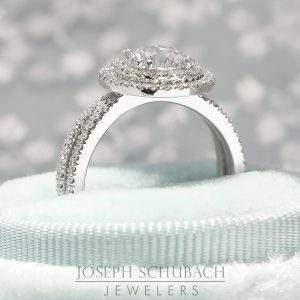 If you’re looking to take your custom design engagement ring to the next level, contact us for your own high bench item.